An open air service will be held outside of St. Andrew’s Church in the centre of the village. All all welcome to attend this informal family service. Enjoy hymns of praise, prayer and worship in the midst of spectacular mountain views. This treat is not to be missed. This entry was posted in Services, Special Events on July 27, 2009 by angelweb. Chamber Choir Concert, Wednesday 12th August, 7.30 pm, in St Andrew’s Church. Exultimus, a chamber choir based in Newcastle upon Tyne will be giving a concert in St Andrew’s Church, Coniston on Wednesday August 12th. Each year, this close group of singing friends, visits a different part of the British Isles, usually part of the celtic fringe, enjoys a sociable holiday, and gives a concert for the local community. Notable expeditions have been trips to Brittany and Tuscany (for our 10th year). 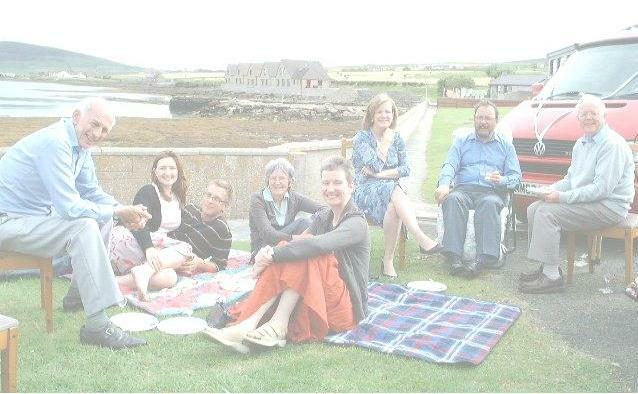 A couple of years ago in Orkney, one of us, Jane, sprang her wedding on us! We rose to the occasion with a specially composed piece by another of our members, Philip, and an impromptu ceilidh and wedding march. Earlier this year Exultimus enjoyed taking part in a chamber choir master-class given by Paul Spicer, the eminent conductor and expert on English choral music. The programme of the concert will include motets, madrigals, part-songs and folk-songs. To mark the various musical anniversaries this year we shall be singing some Mendelssohn, Purcell, and Robert Burns. Also featured will be some rounds, Vaughan Williams Three Elizabethan Songs, and several powerful short motets by Victoria and Monteverdi. We also plan a couple of surprises with a local flavour! On Sunday 9th August, Exultimus will sing Choral Evensong at St Andrew’s, including Stanford in C, and his motet â Coelos ascenditâ. This entry was posted in Services, Special Events on July 20, 2009 by Arkangel. The Old Testament prophets write of someone coming along after years of neglect, dusting off some old scriptures, and reading them to entire congregations. Perhaps it’s time for us to dust off the scriptures and just read them in church for anyone who is passing by. Any fellow Coniston church members are welcome to come in and read. To sign-up or take a look at the schedule, sign in as a guest at the following link. Contact Mark on 41262 or Pamela on 41997 for the password. It is thought that we will begin with the book of Jeremiah (as written in The Message) then time permitting, move to Luke, Romans and finally Revelation. This entry was posted in Discipleship on July 5, 2009 by angelweb. Churches Together in Coniston will be holding a service on the shores of Coniston Water. This informal service is for locals and visitors alike. Come along for sparkling views, prayer, praise and morning worship. This entry was posted in Services on July 4, 2009 by angelweb.